It has started. 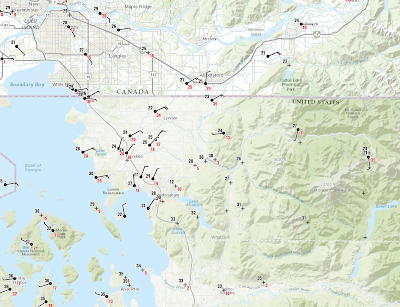 Cooler air is streaming in above us and snow is now falling around Bellingham, where gusty northeast winds have developed. And although much colder temperatures are now guaranteed this week for our region, the amounts of snow on the ground will vary substantially. First, proof of the snow is found in several of the WSDOT cams around Bellingham (see below). A plot of the observations around Bellingham shows the the strong, cold northeasterly flow coming out of the Fraser River Valley. At Lyndon, the temperature was 22F, with gusts to 34 mph. It will get worse there. 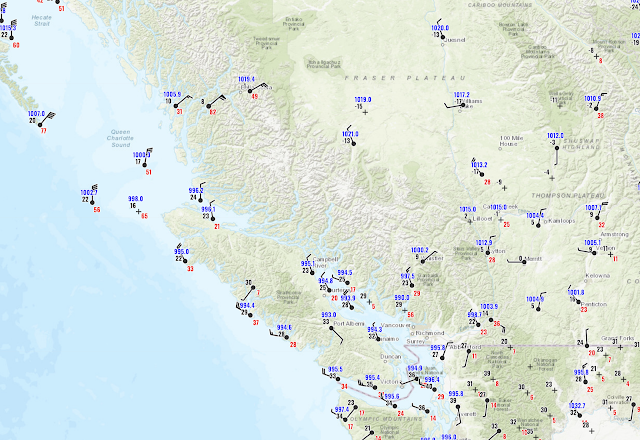 If you really want to be impressed, here is a more regional view, with temperatures way below zero (black numbers to the upper left of the circles are temperature) in the BC inteior, with very strong northeasterly winds (gusts to 82 mph) pushing offshore north of Vancouver Island. These winds are driven by the strong high pressure over the interior of BC..the same high pressure that will push cold air into NW Washington. As the cold air pushes offshore it passes over the relatively warm waters of the eastern Pacific (around 50F), resulting in a big change of temperature with height and instability, which in turn produces lines of cumulus-type clouds (see below) that grow and are circling towards us. A cyclonic circulation/low pressure area is developing offshore. 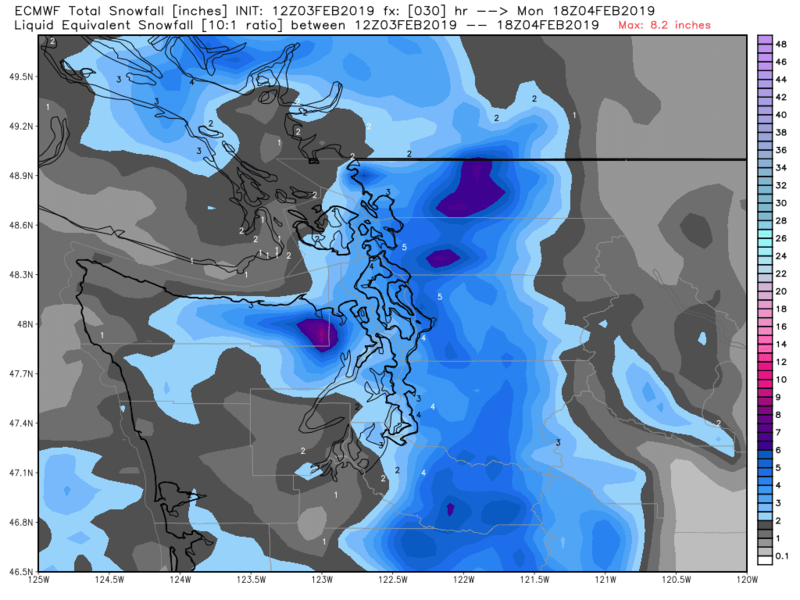 The latest UW high resolution forecast for the 24 hr ending 4 AM Monday shows perhaps .5 inches of snowfall over central Puget Sound (remember snowfall is NOT necessarily snow accumulation). MUCH more over the northern side of the Olympics and heavier amounts (a few inches perhaps) over some areas of SW Washington and around Bellingham. 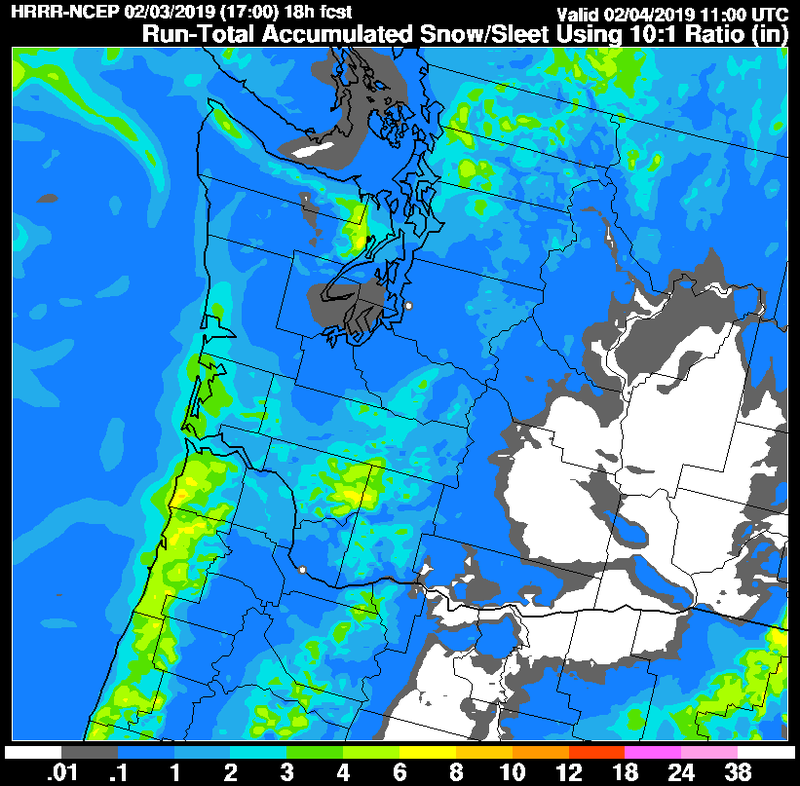 The next 24-h shows drying to the north and a bit of light snow over Seattle and and to the south. (and more on the north side of the Olympics). Looking at last night's high resolution ensemble forecasts of accumulated snowfall (a UW exclusive! ), we see huge variability in the snow forecasts (thus lots of uncertainty), with the average (dark black line) of about 1 inch. 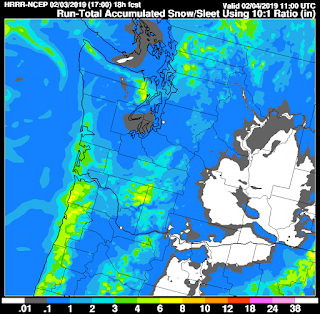 The latest NOAA/NWS high resolution rapid refresh model (HRRR) total snow total through 3 AM Monday has .1 to 1 inch over Seattle, with more over NW Washington, the northern Olympics, and the coast. Now, there is on outlier forecast that I should mention. 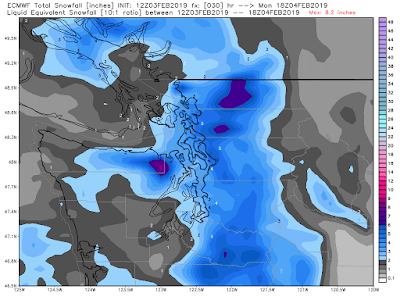 The European Center model, which is lower resolution that the UW model, but often produces an excellent large-scale forecast, is going for much more snow over the interior (see below)---like 3-4 inches over Seattle for the period ending 10 AM Monday. This represents the extreme high end possibility. 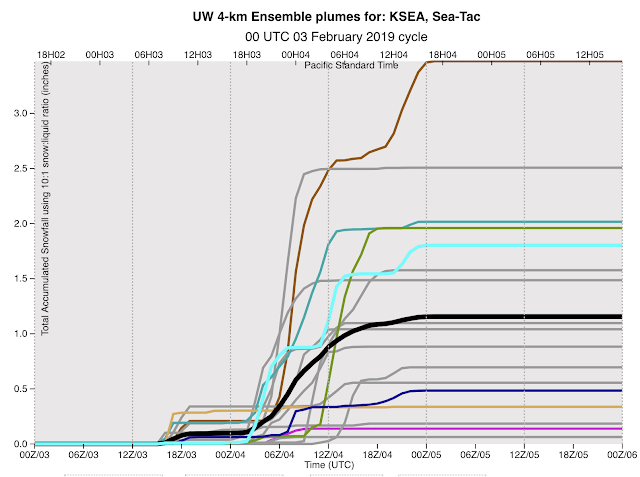 We can be certain that temperatures will really cool down, with highs tomorrow in Seattle to the mid-30s (see Sea-Tac ensemble temperatures below) with lows in the 20s on Monday night. 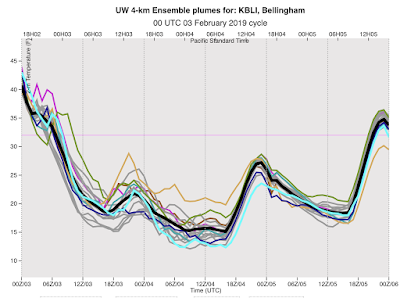 Bellingham will be something else, with lows dropping into the tens. Accompanied by strong winds, the region north of Bellingham will have wind chills way below 0F. Bottom line: The air has started to cool above us and is rapidly becoming cold enough for snow. The big problem is lack of precipitation...this is NOT a wet system for us, partially because the upper trough and low center is too far offshore. Temperatures will cool below freezing tonight in Puget Sound and even cooler Monday night/Tuesday morning. Snow amounts will vary greatly, but generally will be light. Seattle will get perhaps .5 to 1 inch of snowfall, but accumulation will be hampered by our generally warm roadway surfaces. 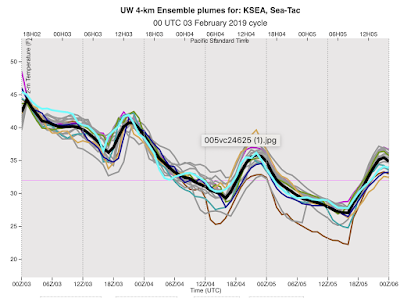 But don't be shocked if central Puget Sound gets very little or a bit more....there is substantial uncertainty in this kind of forecast. The blog beats “local on the 8’s” on TWC. went on utube to hear music from local on the 8’s going back to 96 when I started paying attention. All nostalgic now. North Everett: hail began around 11:20am, quickly followed by wind. 11:55am snow is falling steadily and beginning to stick to the ground. And brrrrr it's getting cold out! Cliff why don't you reference the European model as often? I've found it to way more accurate in forecasting our snow. Already a trace on the ground in Lake Stevens! Yes - the Bow weather rock was getting white by 9:00 AM Sunday. If the Northeasterlies kick up as suggested, things will be really rocking here because we are very exposed to those! I started driving south from Bellevue around noon. When we departed there was no precipitation. In Fife we began to get some precipitation, then when we arrived in South Tacoma at about 12:45 there were snow flurries, but bothing sticking yet. Snowing/hurling steady in Woodinville. Sticking on roadways and other surfaces. Thank you very much for posting these detailed forecasts Professor! 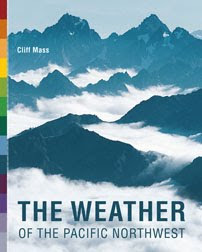 So Cliff - do you buy into the IPCC's "2030 or doom" scenario? Fantastic explanation, Cliff. Light snow is falling in NE Seattle now, but the runners are still running, the bikers are still biking and the dogs are high energy. We feel very special up here in Bellingham to be a part of the north country. And, contrary to popular opinion in Seattle, we do have pizza delivery. 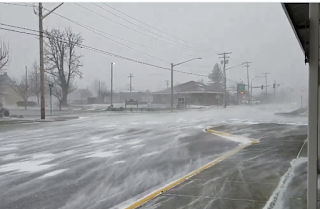 Light snow is falling in upper Fremont. Snowing well at Shoreline/Edmonds boundary. Not sticking on the roads yet, but the temperature is dropping fast. Just hoping the roads don't ice up before I can leave work! 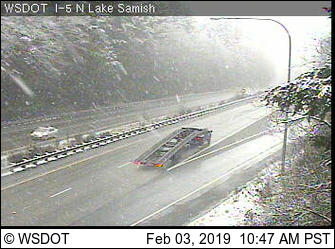 Snowing in Lake City Way as of 2:45. Big huge wet flakes transitioning to regular snow. Sticking to everything but concrete. Snowing heavily in Kirkland and Bellevue. 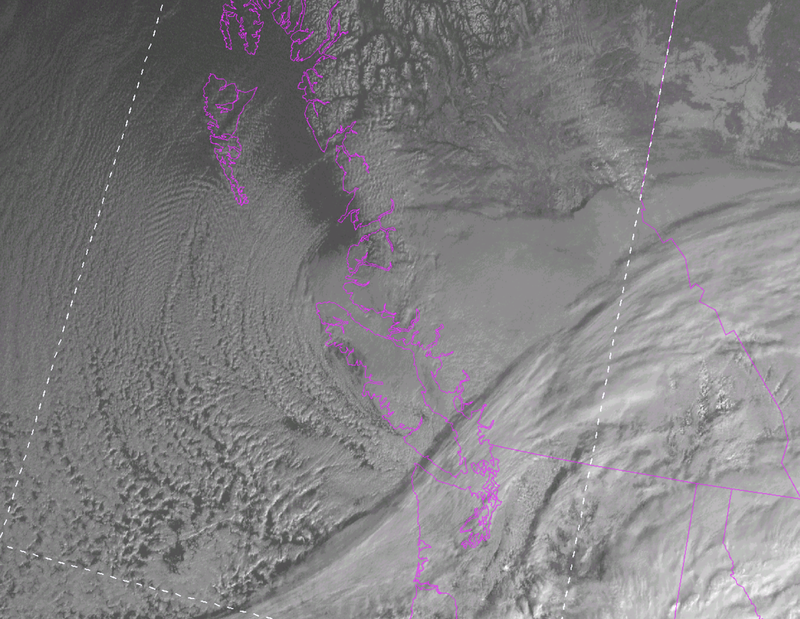 ..
Upslope forming over Sequim as forecasted. Nearly two inches on my deck already and snowing hard. Temps dropping into 20's. Streets wet but not freezing yet given air didn't go below freezing until late morning. With the cold air assured, the devil is now in the details of how much moisture gets pushed up against us from the north. Need FRO winds to pick up a bit more here to ensure it continues all night. My Labs were out sniffing the north air first thing in the morning and were excited. They smelled snow coming. They've already tried to slide down the hill in it, on their backs as is the nature of two of my dogs, but need another inch to make that optimal. Good forecast, with the guidance from three days ago turning out to be about right. 3/4 inch on the ground at 4 pm on the west side of Bainbridge. It’s coming down hard. Thanks for all you do Cliff. 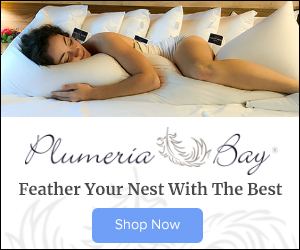 We love your blog. 2" on surfaces already in Suquamish, first inch on the ground melted. Gonna be fun when that freezes. Tapering off, lake City Way. Slightly over an inch so far. Cliff, is this the storm that was forecaster for late this evening, or is that another band that will be coming through? Looks like NWS may have underestimated the severity and speed of the cold temperature drop here in Bellingham. At our house, which is about a mile from the airport reporting station, the temperature dropped quickly, going from 33F at 8 am to 23F at 3 pm. Currently, it is at 21F. But the more worrisome issue, is the high wind warning for gusts to 60 mph. This is the first significant wind from the north and east this season and would be greater than all, except one, of the numerous southerly wind events throughout December and January. This big change in wind direction can expose many trees and structures to winds not earlier experienced. I was thinking we might avoid a Fraser River event this season. No such luck. The big worry on these extended cold events is how they end. With a lot of sustained cooling, there is always the concerned for freezing rain when the first southerly storm comes through. I fear that many of our plants will be badly damaged. There was a lot of springlike growth because January was so mild. Already beat that 0.5 inch in NW Seattle (Crown Hill). 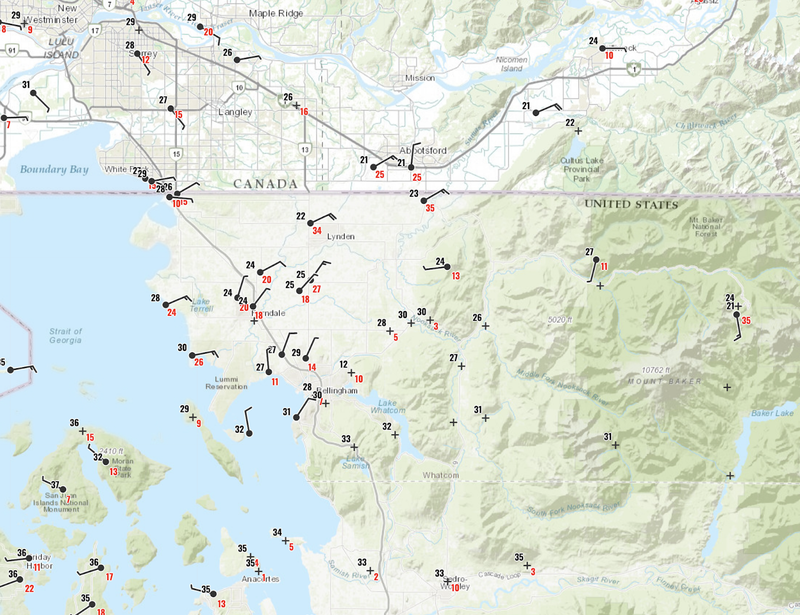 Already 19 in Bellingham. Being a wimp, I walked my bicylcle the 2 miles from my volunteer job at the Spark Musueum to home tonight as there were patches of ice on the road. Cold; with 20 knot head wind, but uninjured and feeling well. Since I am retired and am in no hurry, I will leave bicycle at home and walk around tomorrow (Monday ). I measured 1.5 inches on my porch rail a few minutes ago, and it's still lightly snowing. I'm in the middle of West Seattle, and it started snowing just after 3pm. I'd love to see your updates - has anything changed since you updated earlier? I'm seeing predictions that we continue seeing snow until 10am or so, and if that's the case I'm very curious about expected accumulations. Almost 9pm in Lynnwood with 3" snow on the ground. More to come tonight and Monday morning. Seems the EURO model is the one to beat! 5:30 am clearing driveway in Skagit. I found its key to clear this snow fall before driving on it. Else the snow compacts into ice with vehicle weight on it. It started snowing here on south Whidbey Island (elevation 465 feet) around 11:30 a.m. (2/3) in the form of graupel, but soon changed to snowflakes. At the beginning, it appeared on the radar as a typical south Whidbey convergence zone, with snow as far south as the southern tip of the island but no farther south. The snow slowly spread north up the island and continued at our place on and off, very light to fairly heavy, up to the present. As of 7:30 a.m. on the 4th, we have 6-7 inches. You're wife must be good friends with mother nature of all seasons, or simply a persuasive dancer!